My sister-in-law Lisa likes pigs–the image of them on plates, cups, dish towels, etc. So when she and my brother got married, the piggy gifts poured in, and the passing of the wedding did not stem the tide… Eventually I think we all took a look around their house and realized we had to stop. But that’s what happens. Celebratory events approach and people start worrying about finding the perfect gift, then you mention a particular type of something you sort of like and it’s a real “Eureka!” moment for everyone who knows you. A few years later, you need a bigger house. Allow me to introduce the latest addition to our family. To be fair, this started out as a pot for my little niece, but making a teapot is hard and making a teensy weensy teapot is brutal. Fun, but brutal. This was as small as I could go, and though it fits in the palm of my hand, she wouldn’t be able to lift it. Fortunately she’s a bit too young for a ceramic tea set. Hopefully as she matures, so will my throwing skills, and eventually it will all come together. 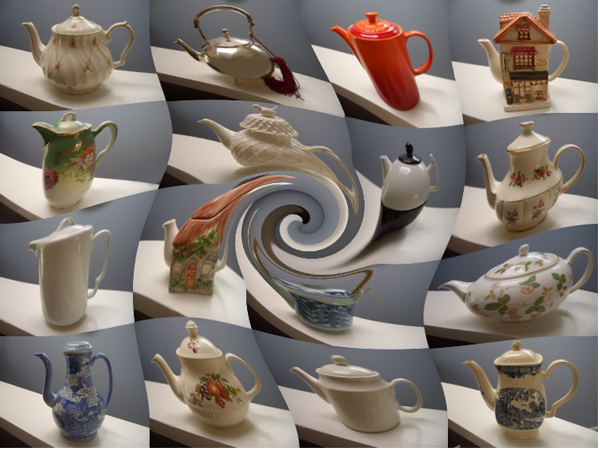 When you take the ease of buying a teapot away and have to build it yourself, you start to think about a pot’s form and function in a different way. Spout position, handle size and shape, even the size of the knob on the lid–all play an important role in how functional the pot will be. When one of those things is off, using the pot can become a real drag. One of my favorite pots to look at is one I use the least. I can never remember why I don’t use it, then I start to pour the tea and the stains start to appear on the tablecloth, and it hits me–the spout doesn’t work properly. Don’t be lured into buying something simply because it’s beautiful, unless it’s going to be a display pot. If you’re going to use it, it should work well. Is it well balanced? 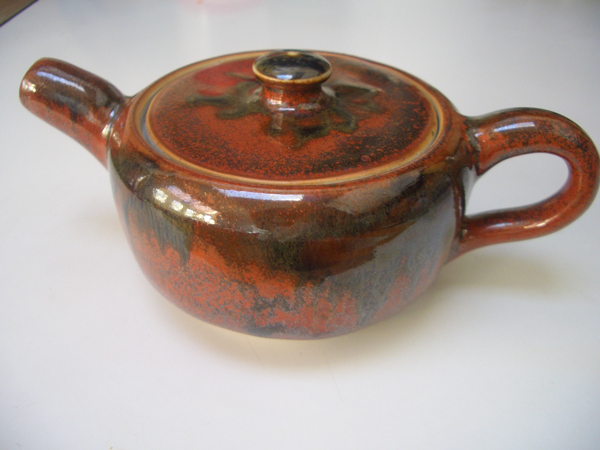 The spout, the body and the handle should relate to each other, not look like they came from different pots. What’s it like to hold the pot? Feel the weight of it. Imagine it filled with liquid. Is the handle well shaped, and can you hold it with one hand comfortably? Is the spout well formed? Does it seem likely to drip? Is it angled correctly? 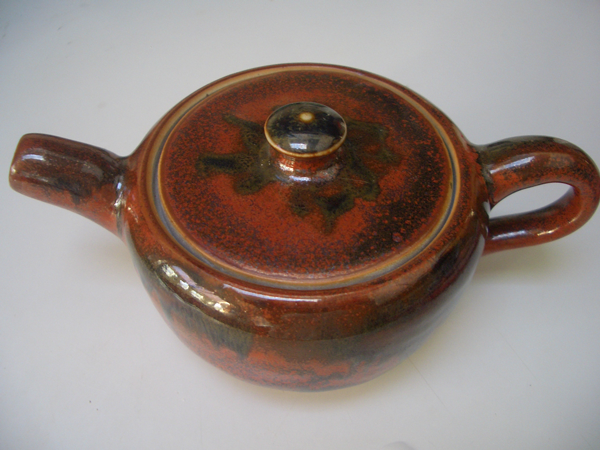 The top of the spout should be level with or above the highest point of the body of the pot. Otherwise you won’t be able to fill the pot to the top without the liquid running out of the spout. Will the shopkeeper let you run some water through it to see how it performs? Can you return it if it doesn’t function well? If you’re paying a lot of money for a pot, I think these are reasonable questions. Does the lid fit well and is it made to stay secure when pouring with one hand? You don’t want the lid dropping into someone’s lap or clattering down on a table filled with delicate ceramic ware. Does the pot have a leaf strainer at the base of the spout? This is a matter of preference. I prefer pots without strainers. My friends and I do tea leaf readings, and it’s hard to get a good flow of leaves with a strainer present. If I want to strain the tea, I use an external strainer over the cup. But you might want the strainer. You MADE that?!! Holy shiitake!